Commercial Hardscape Ideas - Executive Landscaping, Inc. The word “commercial” doesn’t have to mean boring – especially when it comes to landscaping and hardscaping ideas. Think about it: If curb appeal is important in selling a home, how much more so is it vital in selling a company? Well, maybe not selling it so much as attracting clients or customers to come in and see what it’s all about. The better it looks on the outside, the better the opinion it will generate before anyone even goes inside. Which means that things like landscaping and hardscaping are even more crucial than you might realize in making a business more successful. Think of it not as a frivolity or an unnecessary item that can fall to the bottom of the list in your budget, but as a marketing tool. After all, the more beautiful the property, the more confident people will feel in the quality of the product or the service being provided by that business. Green spaces, gardens, and plants are all crucial aspects of a commercial property to be sure. But hardscapes are also a great way to boost commercial curb appeal. In fact, curbs are hardscape features themselves. So, as you survey your commercial property, think about what YOU would want to see as a potential client or a new customer. What would draw you in? Be creative and think outside the box, and you may see your buyer pool start to bubble like the middle of a newly installed water fountain. All commercial properties require certain things: walkways, driveways and parking areas. 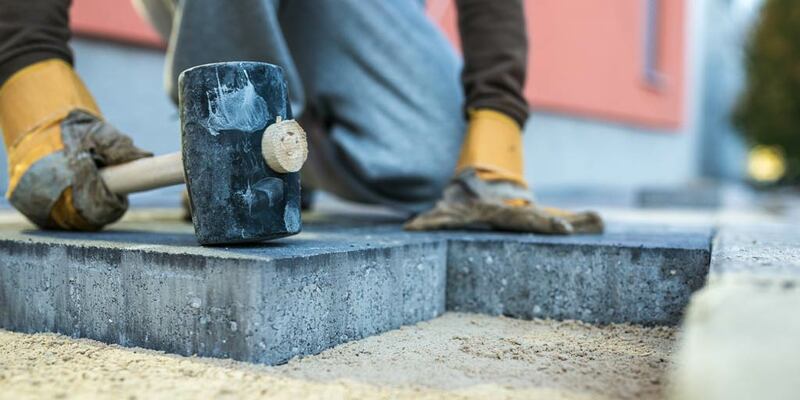 Rather than leaving those areas to the mercy of poured concrete, use materials that have more visual appeal like paver stones, pea gravel or stamped and textured concrete. You can achieve a customized look that sets your business apart from all the rest and makes you memorable. And in business, that’s a great return on investment. benches, pergolas for shade and fountains that have a soothing effect. Giving people a pleasant place to linger is never a bad thing. You’ll also be providing a great place out in the fresh air for your employees to spend their break time or lunch hour, which has been proven to boost productivity and workplace happiness exponentially. Remember, your property should be a point of pride for you and call to people. The more standout the features, the more appealing you’ll be. Hardscaping is essential in creating that stand alone look, and we at Executive Landscaping, Inc. have years of experience in working with commercial clients across the Gulf Coast to give them a masterpiece. Give the hardscaping experts at Executive Landscaping, Inc. a call to learn more about how we can create an Executive Masterpiece for your commercial property today!